Mayor Thomas Menino, his wife Angela (right), and his grandson Thomas Menino III were greeted by Boston students. 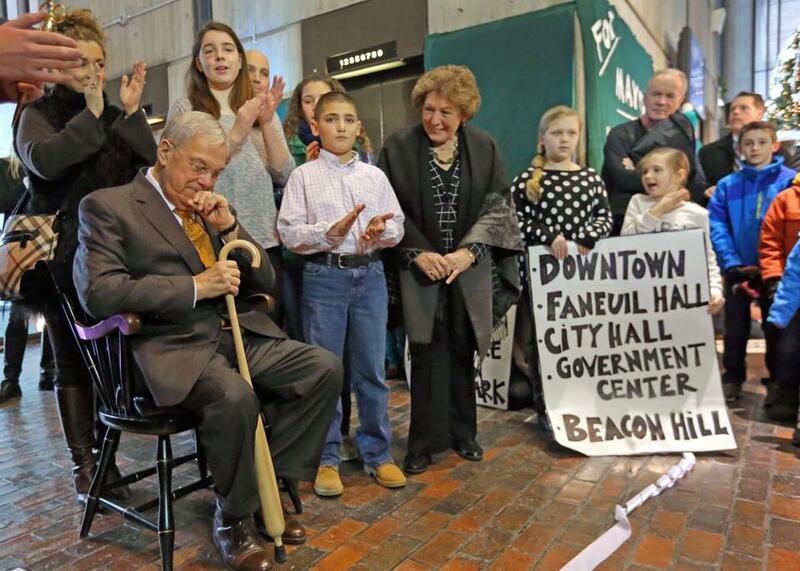 The atrium near the City Hall elevators was packed, as Mayor Thomas M. Menino was led out of his fifth-floor office and down to the ground level. 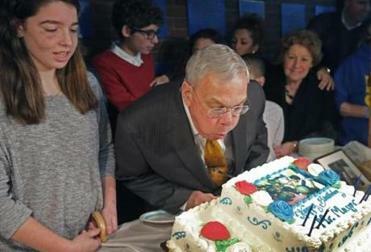 When the elevator doors opened, Menino was shocked to find hundreds of friends, city employees, and school children gathered to wish him a happy 71st birthday. In addition to a spirited rendition of “Happy Birthday,” the event featured a tribute to Menino that highlighted his focus on education while in office, as well as the unveiling of a series of tiles painted by Boston schoolchildren to depict various Boston neighborhoods. Menino has been honored at countless events during his two decades as mayor, but this may have been his first surprise party. “I want to get my staff and kill ’em; I was very surprised,” Menino told reporters after the party, during an emotional question-and-answer session in which he, at least once, teared up. The 28 mosaic panels, which together form an exhibit titled “Our Boston,” were created by 2,500 students from Boston public schools. The images, designed with colorful tiles, depict scenes from almost all the city’s neighborhoods and hang in the foyer just inside City Hall’s front entrance. “We wanted to make sure that when he left, he left a mark here, a reminder of the love he has for children and that children have for him,” Martha Pierce, the mayor’s education advisor, said during the short program. The birthday celebration was the latest in what has been a lengthy farewell tour as Menino, who chose not to seek reelection earlier this year, prepares to depart City Hall. The mayor, first elected in 1993, spent 30 years in elected office, including a decade as a member of the City Council.